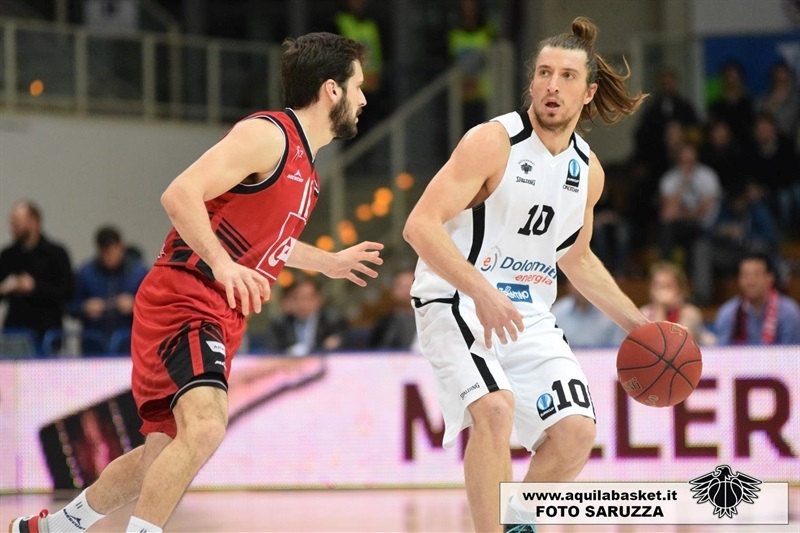 Dolomiti Energia Trento booked a place in the quarterfinals with 79-65 win over the visiting CAI Zaragoza in eighthginals Game 2 on Tuesday night. 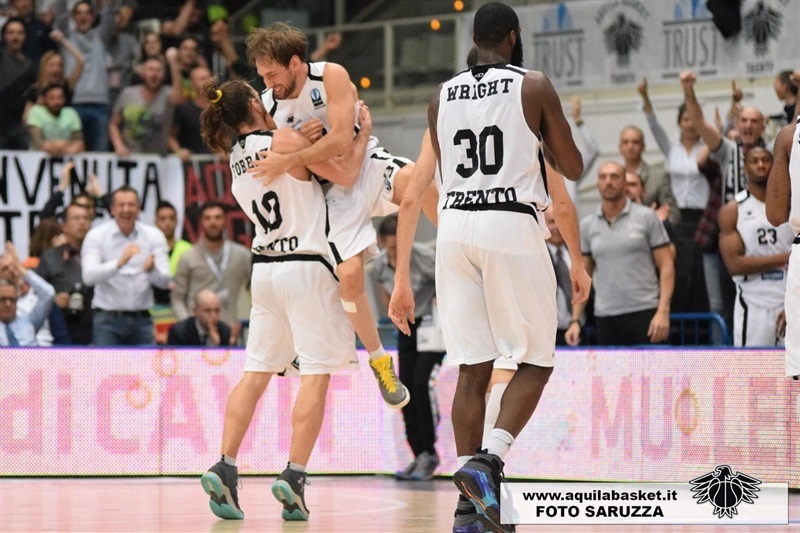 Trento won the two-game series 162-150 on aggregate after CAI won Game 1 a week ago 85-83. and will play either EA7 Emporio Armani Milan or Banvit Bandirma in the quarterfinals. 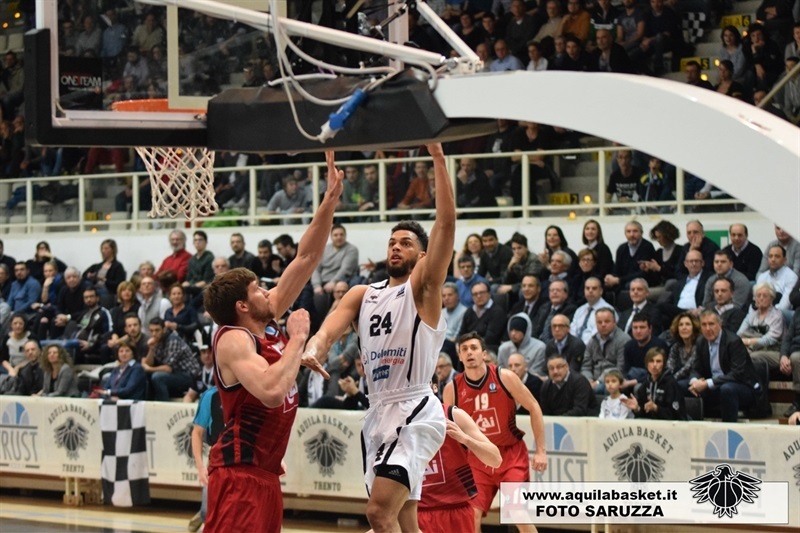 Leads went back and forth in the first half, and things were tied at 33-33 at halftime, before Jamarr Sanders led Trento’s third-quarter charge, and a 14-4 spurt that opened 55-44 lead. 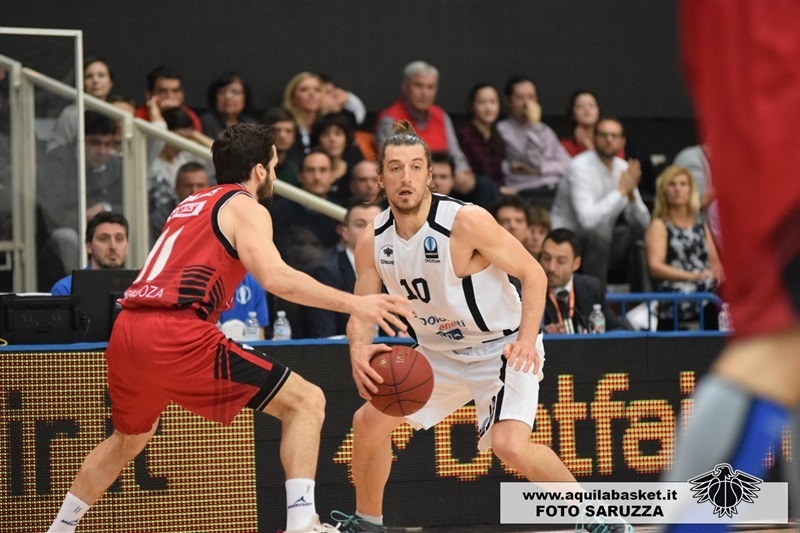 CAI did not go away, but it never came closer 6 points the rest of the way, as Trento’s defense finished the job. Julian Wright paced the hosts with 21 points, 8 rebounds and 3 blocks. 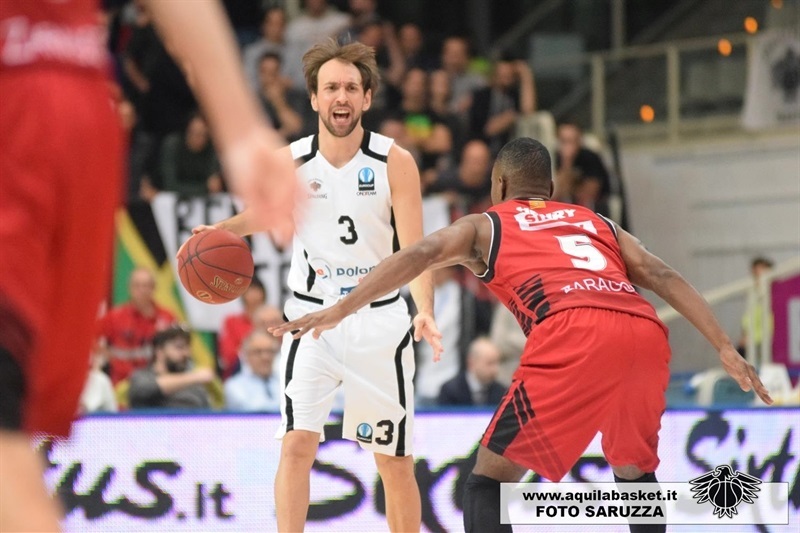 Davide Pascolo scored 16, Jamarr Sanders had 9 of his 11 points in a key thre-quarter run, and also pulled down 7 rebounds, and Andres Forray also scored 11 in victory. Joan Sastre led CAI with 16 points, Isaac Fotu had all of his 12 points in the first half, and Henk Norel finished with 10 in defeat. Pascolo scored 7 points, including a three-point play, helping the hosts open 11-4 lead. But Sastre scored twice, including hitting one from long range for CAI, before Fotu made a basket-plus-foul to tie things at 15-15. A three-point play from Wright ensured Trento was up 18-17 at the end of first quarter, but Fotu scored a pair of baskets early in the second, giving CAI 18-23, and a 7-point advantage on aggregate. However, Wright scored 6 consecutive points, and a put-back by Pascolo helped put the hosts up 28-23 midway through the second. Now, it was CAI’s turn again to make a run. Fotu and Sastre sparked a 0-10 spurt, capped by a three-pointer from Tomas Bellas, before Trent Lockett’s triple helped tie things at 33-33 at halftime, which meant CAI was still in front by 2 points in the series. Wright, Pascolo and Andres Forray kept Trento with slim lead early in the third, before Slava Kravtsov and a four-point play from Stevan Jelovac had CAI regaining the lead, 39-40. 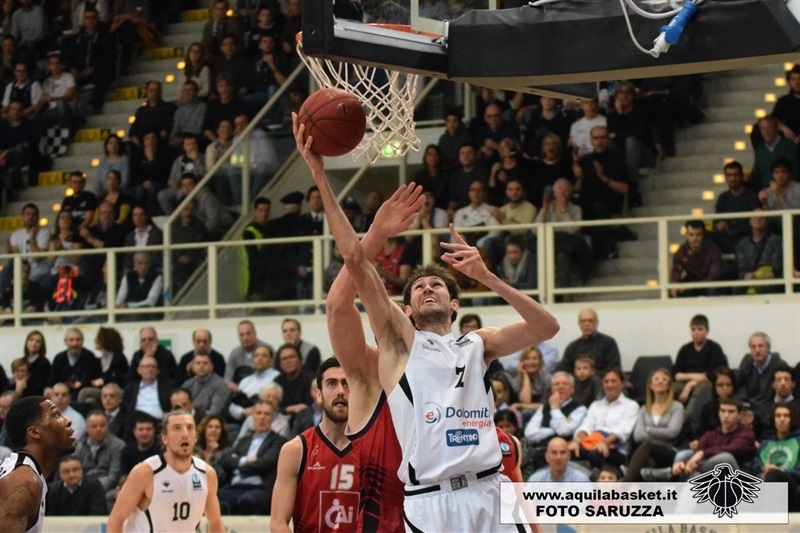 But Giuseppe Poeta nailed a three for Trento, starting a 9-0 run capped by a Sanders put-back. Jelovac snapped CAI’s 2-minute drought but Pascolo hit for two, and Sanders for three to make it 55-44, and a 9-point margin on aggregate. Norel and Sastre’s second three-pointer had CAI back in range, but Sanders scored his ninth point in a 4-minute span, and Lockett added a fastbreak basket to make it 59-49 after 30 minutes. After CAI’s Norel and Robin Benzing traded baskets with Trento’s Luca Lechthaler and Wright, Jordan Swing nailed a triple that cut the deficit to 63-56 on the night, and 5 points on aggregate. But with both defenses tightening up some more, a pair of baskets from Wright restored 67-56 margin for Trento with 5:07 to play. After a timeout Pascolo extended it to 13 points, but CAI replied through a pair of Sastre’s baskets, but Wright scored on a fast break for Trento, and Forray made a floater to make it 75-62 with 1:28 to go. 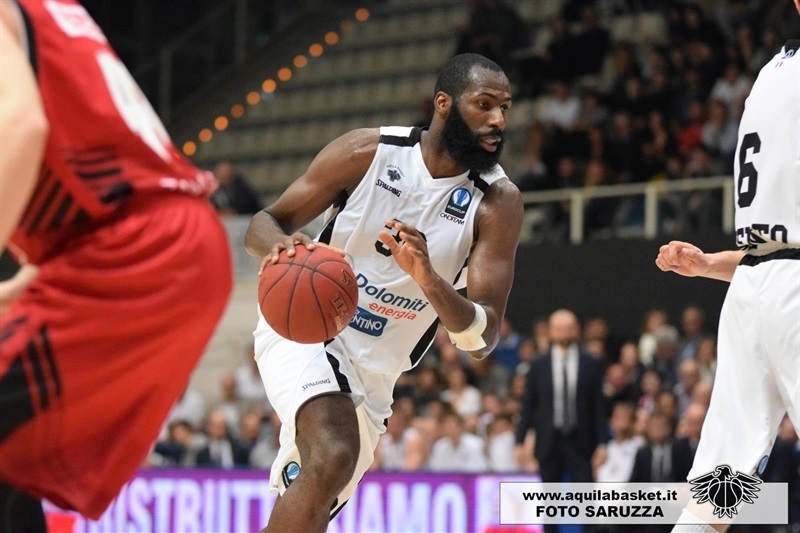 Forray ran a fast break to open a 14-point margin in the final minute, as pack arena celebrated Trento making its way into the Eurocup quarterfinals. "Tonight we've did something astonishing not only for us, but also for the history of Italian basketball as a whole. We managed to steal many balls, work fantastically on their three-point line. In the second half, we managed to reduce the number of our mistakes, pass the ball efficiently and open the space for our shooters." "It was a very physical first half, where both teams had chances to lead the game. We knew that Dolomiti Energia Trentino would push hard in the second half, but we struggled playing our own basketball. We suffered from their penetrations, and we didn't manage to deal with them."